I was born in the district of Sarria Sant Gervasi, one of the areas of Barcelona that still preserves a village-like feel. It actually used to be an independent village that was finally eaten by Barcelona and lost its independence in the early 1900s. If you like going off the beaten path and see how locals live, this is a great place to go: it’s easy to walk, has lots of interesting shopping and cafés plus some minor sites of interest, and being an upper-middle class neighborhood it feels totally safe. The tourist bus has a stop there, on its way to the Pedralbes Monastery (Pedralbes used to belong to Sarrià until the city council decided to transfer it to the Les Corts district – and locals are still resentful of that). Plus the FFCC trains departing from Plaça Catalunya have a line that takes you there, too. So it’s quite well connected with the city center. So today let me take you by the hand and lead you around my favorite places in the quarter were my parents continue to live. This long street is the axe of the neighborhood life. You might not need to walk the whole thing, but the section between Plaça de Sarrià and Plaça Artós will be most interesting. 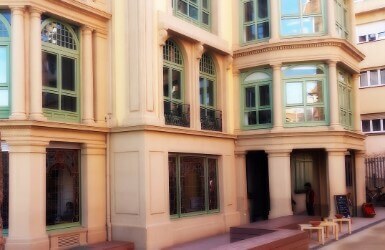 Start in Plaça de Sarrià, with its Sant Vicenç church: here are often celebrated outdoors markets. Then walk down the street passing bakeries that smell of just baked bread, local shops where locals do their errands, and cute boutiques that will lure you into trying their stylish clothes. Make sure to stop in Pastisseria Foix, owned by the family of a famous local surrealist poet, where they make the best traditional cakes in the neighborhood, then just one block further down, stop again in Bar Tomas to try their fabulous patatas bravas (fries with aioli sauce and a red spicy oil made with their own secret recipe). Many Barcelonans swear they are the best patatas bravas in town… and I agree! Check out some of the charming alleys coming off the street: Canet with its cute individual dwellings now occupied by craftsmen and local institutions, and Passatge de Mallofré with its narrow tunel of access that takes you to some gardened private yards. But before leaving Plaça de Sarrià, take a little the detour to cross the Mercat de Sarrià, the local market made of red bricks, and exit the building from the other side looking for the Plaça de Sant Gaietà: a narrow alley will take you to one of my favorite corners in the district: a public plaza that almost feels like it’s a private courtyard. The neighbors take pride in keeping it full of flower pots and greenery, even hanging from the walls (you might eventually see them watering the plants). Now that it’s forbidden to park there, the plaza is full of charm, and in the Summer when the bougainvillea is blooming, it’s even more spectacular. Very soon after you start walking down Major de Sarrià you’ll want to take another detour to the right, where opens the Plaça del Consell de la Vila – the Square of the Town Council. Facing the quaint outdoor tables of a bakery stands the Ajuntament de Sarria, the town hall. Don’t be afraid to get in: it’s a public building and the entrance hall is free of access. The Sarrià giants welcome you at the entrance: they are used for local parades. And if you ask the concierge, he’ll let you walk up the stairs to admire the decoration of the staircase displaying the coats of arms of the different quarters that compose the district of Sarrià. Back to the square, a little alley takes you to another charming plaza, also accessible from Plaça de Sarrià, that in June gets all carpeted with the flowers of an old tipuana tree. Take now Jaume Piquet, another side street that stems off Major de Sarria and walk all the way to the end (just a couple of blocks, really) to see a beautiful modernist building: Casa Orlandai. Originally a farmhouse or “mas” in Catalan, then a school for almost 50 years (a good friend of my teenage years studied there) until it closed in 2003 to become a community center offering a variety of workshops, conferences and activities for the neighbors (my mom and dad love to attend their jazz nights). I love having a coffee and a homemade cookie in their café with huge windows decorated with stained-glass. 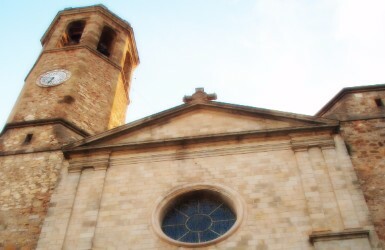 On your way back to Major de Sarrià, take a little detour to check out another quaint plaza: Sant Vicenç. I still love to come here every May 11th to check out the traditional herbal market of Sant Ponç. Now I’m taking you further away, almost bordering the border with Pedralbes. If you are hungry, stop at the tiny Café Dole to try their sandwiches and veggie omelets: delicious! (more ideas for Sarria restaurants here). But my favorite is their iced coffee with lemon – so refreshing in the Summer! Even if I don’t leave in the area anymore, I still try to come at least once every Summer to try it (and in the winter I love that they give you a piece of chocolate with your coffee, too. But now on to the park where I spent so many hours playing as a child. You might be wandering why do you need to see a playground, but that’s not what I want you to see there. Santa Amèlia used to be the private gardens of a local wealthy family and they are now one of the most romantic gardens in town now – although only neighbors really know about it. Walk around the lake where in the Summer you’ll hear frogs croak (so unusual for Barcelona! ), smell the scent of the ancient eucalyptus tree, and seat in the cypress tree pergola after strolling around the alleys lined up with chestnut trees. Across the street there’s another park worth checking: Vil·la Cecília (or El Casal, “the Big House”, as locals call it), with its cypress tree paths that almost look like a little maze, and the villa where the original owners of the real state lived – now another busy community center. Taking the exit from the other end of the Vil·la Cecília park you’ll reach the church of the Caputxins – meeting point of the Catalan (often separatist) Catholic community – the Spanish-speaking Catholics of the neighborhood prefer Santa Anna and San Odón instead. 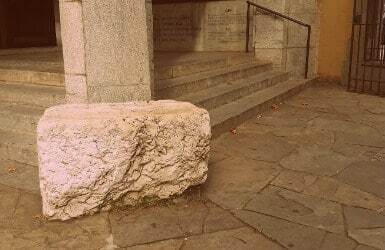 Next to the porch of the church you’ll see a block of white stone, that according to the tradition Saint Eulàlia used to mount her horse. If you’ve already been to the Cathedral of Barcelona, her name will ring a bell: she was the first patron saint of Barcelona, tortured 13 times by the Romans until she got killed and now she’s buried in the crypt of the Cathedral. But… they say she was born and raised in Sarria more precisely in an area further north of the now Plaça de Sarrià, in what locals call the Desert de Sarrià. Raised as a Christian, she decided to move to the city to preach and that’s what got her in trouble with the Romans. So what about you? Head to the comments below and tells us: from all the Sarrià sites I mentioned in this post, which one you’d like to see the most and why?